It was only when James Milner was preparing to take the penalty that gave Liverpool the lead, at the end of a frenetic first-half, that it finally felt safe to take your eyes off Naby Keita. For the previous 44 minutes Keita had hurtled around Selhurst Park - part-brilliant and part-infuriating - with such relentless energy that it looked like someone had cut his brakes. There were turns, there were twists, there were defence-splitting passes and there were inexplicable mistakes. It was wide-eyed and breathless, and it was as if Keita had taken it upon himself to provide a one-man embodiment of everything we have come to expect from Jurgen Klopp's Liverpool side: Forever thrilling, forever erratic. On the evidence of this, and a similarly all-action performance against West Ham United last weekend, it is no wonder Keita has slipped into the first team so seamlessly since his £52.75m move from RB Leipzig. It is telling that the 23-year-old is already leaving his mark on this side, while Fabinho - another expensive midfield recruit - was not even included on the bench here. "He plays a similar position that he was in at Leipzig," Klopp said last week as an explanation for Keita's early inclusion in midfield. A more simple reason might be that he is simply too exciting for the Liverpool manager, who so adores his "heavy metal football", to resist. The highlight of a compelling evening for Keita came midway through the first-half, when he produced a piece of skill so outrageous that the stadium seemed to vibrate in a collective groan of admiration. 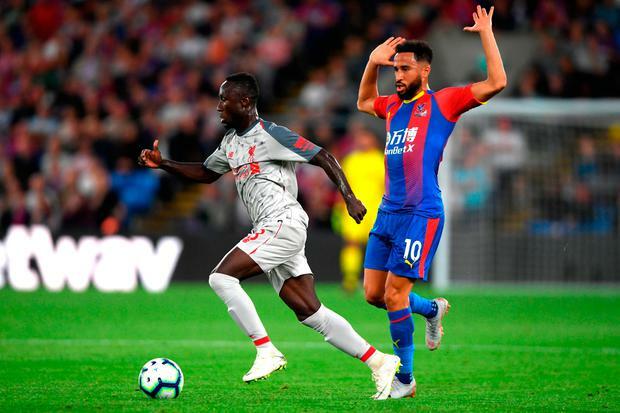 Deep within his own half and facing his own goal, he received the ball from Alisson, his goalkeeper, as Crystal Palace's Andros Townsend thundered behind him. A flick of the foot and a drop of the shoulder later, and Townsend had been sent so far in the wrong direction that it looked as if he had entered the wrong postcode in his sat-nav. Twisting away, Keita sent a swirling 40-yard pass on to Mo Salah's toe, who just missed his lob. This was the brilliance, but it took just 90 seconds for Keita to follow it with a moment of comical headlessness. For reasons unknown he passed the ball straight to Townsend on the edge of the Liverpool box. Only the crossbar saved his blushes. It is moments like these that show how different Keita is to Chelsea's N'Golo Kante, the player with whom he was so frequently compared before the season began. Kante will rarely be found producing a piece of individual skill like that, just like he will never be found giving the ball away so cheaply. Keita seems a far more volatile prospect. It was inevitable that he would whir a little less wildly in the second-half, as Palace pushed. A chance from the edge of the box was scuffed, and those flourishes became less frequent.